Customer Service eLearning & Onsite Training Customized Engaging Customer Service Training Before You Hit Send! Email was created to make our lives easier, but bad things happen over email every day. Conflict, broken peer relationships, and lawsuits are now regular occurrences as a direct result of improper email usage. Over 90% of business communication is email based, yet studies show that less than 10% of companies provide training to help their employees use email properly. Training on email usage can dramatically reduce an organization’s risks associated with improper email usage. Don’t give employees email access until they know the legal risks of email. Email is a business communication tool and your employees are obliged to use this tool in a responsible, effective and lawful manner. Your employees need to know that if they send or forward emails with any libelous, defamatory, offensive, racist or obscene remarks, they and the company can be held liable. They must also be informed that unlawfully forwarding or copying messages without permission is illegal and they and the company can be held liable for copyright infringement. The legal risks of email usuage need to be included in the company’s email policy and employees should sign a declaration stating they have read and understand the policy. Email communication should be used to exchange information, answer questions, and generate action. It is not appropriate to use email to deliver bad news of any kind. Recipients cannot discern the sender’s emotion and true intent over email and as a result, miscommunication and emotional responses may result. When you have to deliver bad news, opt for a face-to-face or telephone meeting. While you may or may not have heard the term “Flaming,” you very likely know what it is. Flaming is the misinterpretation of the content of an email message that results in a verbal attack over email. Basically, it’s childish bickering in the workplace. Flaming happens every day in corporations and it results in broken peer relationships. Not only is the act of flaming irresponsible and dangerous, but the impulsive email responses can be forwarded or printed out and attract a level of importance and attention that was never intended. So how do you deal with flaming? Resist the temptation to “fire” off a response, re-read the person’s email, take a break before responding, or just pick up the phone to handle the situation. 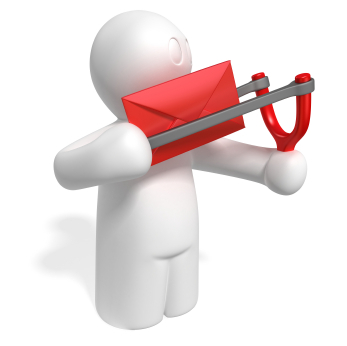 Email can be great tool that saves time and gets things done. Or, it can lead to lawsuits and broken relationships. Establish rules and educate employees on the rules, especially the legal implications, and email will bless you rather than curse you.